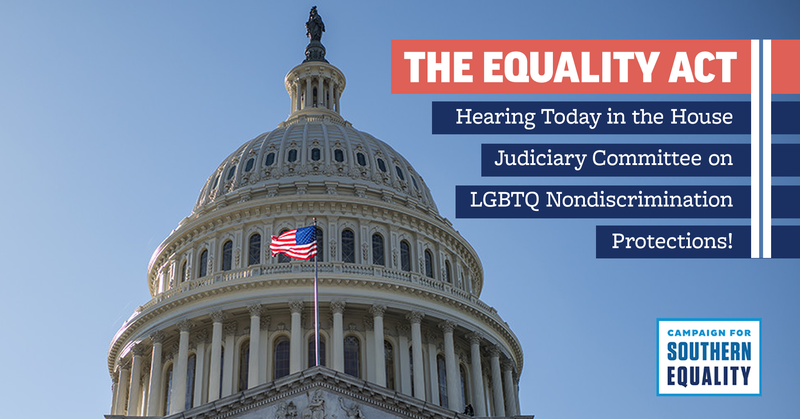 Today, April 2, members of the House Judiciary Committee in the United States Congress are holding a hearing on the Equality Act, federal legislation that would prohibit discrimination based on sexual orientation and gender identity in employment, housing, credit, education, public accommodations, federally funded programs, and jury service. These federal protections, supported by a majority of Southerners, would ensure necessary relief from state legislatures hostile to the LGBTQ community. “The Equality Act is an essential path to the most basic legal protections for LGBTQ people in the South. Right now, more than a third of LGBTQ people in the United States call the South their home, but no Southern state has passed statewide protections from anti-LGBTQ discrimination. On top of this, most of the anti-LGBTQ bills filed each year are filed in Southern states, and we continue to hear story after story of LGBTQ people who are fired from their jobs, evicted from their homes, and denied service because of who they are. “Despite all of this, a majority of people in every state in the South support LGBTQ protections, and we’re seeing progress in Southern municipalities, from Alabama to West Virginia. More and more LGBTQ Southerners are coming out and experiencing growing support from their friends, family members, neighbors, and faith communities. This gives me great hope and shows just how ready the American public is for the Equality Act. Can you take action by urging your members of Congress to take action and pass the Equality Act? Use the tools here to send a quick letter – it only takes a minute. Click below to take action.